If you, a family member or a friend has been recently diagnosed, please visit our Newly Diagnosed page where we have assembled some contacts and resources which we hope will be of use to you. Please see below the pdf file from which you can down load the latest newsletter from this group. 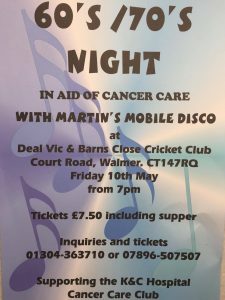 Please see below the poster for Heather’s next fund raising event in aid of the Cancer Care Club. Please contact the numbers shown on the poster to book. Please don’t leave it too late as the tickets sell fast. We look forward to seeing some of you there. We are delighted to inform you that despite having only one craft fair during 2018, Heather has raised the magnificent sum of £1512.80, being the proceeds of the one craft fair and the two 60/70’s discos. Well Done Heather, we all know you have lots of other things going on in your life, but still find time to continue your fundraising for our club. Long may it continue.